Award-winning Italian author Lia Levi is not well known among readers of English, but with the translation and publication of The Jewish Husband, Europa Editions is hoping to change that. 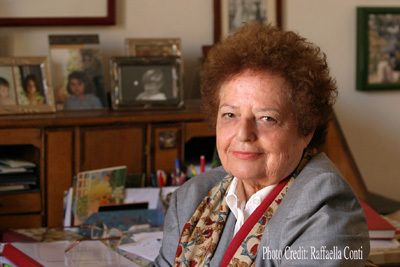 Born in Northern Italy in 1931 to Jewish parents, Lia Levi and her family moved to Rome in the late 30s just as the fascist racial laws were coming into effect. After the war, Levi studied philosophy and became a successful journalist. Levi is perhaps best known for her novels with Jewish themes and she is the editor-in-chief of the monthly magazine, Shalom, which she has been directing for over thirty years. Lia Levi is also a well-known author of children's literature, with more than a dozen books to her name. Among her many awards, she has received the Elsa Morante First Novel Prize, the Castello Prize for Fiction, and the Moravia Prize. It is with great pleasure that we introduce Lia Levi to our readers. Belletrista's Paola Sergi spoke with Ms. Levi recently. PS: The name Levi is linked to many of our literary canon's greats: Primo, Carlo, Natalia Ginzburg; are you also part of the same family and, be your response affirmative or negative, how do you feel linked to them and influenced by them? LL: No, no relation to Primo Levi, Carlo Levi or Natalia Levi Ginzburg. However, I knew Primo Levi well, and with him I found myself at a few conversations with students. I can, therefore, attest to a little something about him: Primo was an wonderful person because of his availability and above all, his humanity. The door to his home was always open to anyone, especially young people, who wanted to know/learn and understand. He was a real Master, who shared his wisdom and profound life lessons with genuine modesty. The fact that, as he himself says, Primo had deliberately used in his writing the soothing and sober diction of the witness and not the angry and hurt one of the victim, is something that has profoundly struck me and inspired me. I made my own his idea, "I write and you will be the judges". PS: What was the atmosphere in your home during your earlier years, from a cultural perspective? LL: My earlier years, those of my childhood, were those of the fascist racial laws issued in 1938, when I was six years old. My expulsion from public school, considering my age, didn't really affect me, likewise my father's termination from his job at the Assicurazioni Generali. My parents tried to "protect" me, leaving me in the dark as much as possible. But, I believe, this made matters worse because I did not know or understand that well what was going on; I vaguely "felt" the gloom of a strange environment. As months and years passed, I certainly became progressively more aware of all that was occurring, but the human being's ability to adapt, especially that of adolescents, is practically infinite. This unconscious "culture" of adaptation, however, disappeared immediately on September 8, 1943 with the surrender of Italy to the Allies, the German invasion and the resulting immediate hunt for Italian Jews, a quarter of which were deported and almost entirely killed by the Nazis. And this was really the dramatic "cultural" depiction of the time. Our family survived and thus we slowly picked up our lives, wounds healed, hopes and dreams returned and emerged, "normalcy" took its course. And along with normalcy reemerged even the humanistic image of my father who, without a doubt, left his mark on me through his love of literature, thirst for books, and a knowledge/understanding still a bit linked to a 19th century concept of culture, where school and "doing well in school" was fundamental. My mother instead loved to read novels, went to the movies, and greatly enjoyed discussing films. PS: Which writers most influenced your development as a writer? LL: My life has been filled with books since childhood. I read everything with zeal and indiscriminately. In other words, not only did I like each book, it enchanted me. Then, during my adolescence, I found myself choosing books, and I realized that, for example, I was more attracted to stories filled with humor and adventure (like Mark Twain). At a certain point, in my early youth, a change became apparent. After what history 'presented' us with, inside of me there began to move a kind of anguishing moral push that led me to read almost every book about the Shoa. It was almost an obligation, which came from deep within me. I believe that from Primo Levi on, I read all of the literature of the Extermination that was being published. From The Last of the Just by André Schwarz-Bart to Death Dealer: the Memoirs of the SS Kommandant at Auschwitz, Rudolph Höss's autobiography, to Into That Darkness: from Mercy Killing to Mass Murder by Gitta Sereny, to Night by Elie Wiesel, the list is long and varied. It's clear that here we are not talking about literary value, even if in many cases, Primo Levi first, there was and is a notable value. But the spirit was different. I read those books because I felt I had to. This is the reason. Today I've somewhat stopped, even though not too long ago I have been overwhelmed by Daniel Mendelsohn's book, The Lost: A Search for Six of Six Million. Then, without however ever neglecting this angle of anguish, I returned to literature and I singled out which are the bases of my writing. I can sum them up in two great names: Singer and Mansfield. Singer is the ultimate example of how existence, doubts, questions, the quest or rejection of God, questions of passions and ethics, are so interwoven in the tale that they do not reveal any effort. In other words, we can say that with him one can find God in a cup of tea, with someone who is already smiling ironically at your senseless discovery. This, for me, is the supreme embodiment of what is literature. The other example, rather contrasting, is Katherine Mansfield. Mansfield makes everything that surrounds us throb, I'd say that "she colors it with existence". For this reason, I say that she helps me to live. Under her pen, objects emerge psychologically animated, like, I don't know, a rocking chair "full of a patient resignation" or the "blue teapot with two white cups that wait", with the clock's ticking that "drips in the silence"... Anyhow, everything becomes vibrant as though constantly quivering/shuddering. Don't you think that a such a 'pulsating' world makes life more worth living? PS: When did you start writing and what inspired you to begin? LL: I began to write for the public very late, when I left journalism. But, paradoxically, I can say that I began to feel part of "the writing world" when I began to read. I have always very much loved reading, from fairy tales to stories for "grown-ups". At that time, there weren't many other modes of communication. I began to take notice of cinema in my adolescence (and I immediately loved it), but the "ghetto" that fascism had created around us Jews ended up forcing us to live in another realm, created from the enchanted tale of vicissitudes experienced by others and in other lands. Then my imagination did the rest; it's worth saying that since then I tried to fabricate stories, realizing well enough that I did not have sufficient means to be a writer. I still have a short letter which I wrote to my adult self, where I approximately said: "Don't say that these dreams are only silly things; become a writer." I followed the advice. PS: What difficulties did you encounter publishing? LL: My first book (Una bambina e basta) is autobiographical and is specifically about my life as a little girl growing up under the racial laws and during the war. The story begins with my expulsion from school in Turin due to the laws of 1938, and it ends with the liberation of Rome, where I was living at that point, which happened in June of 1944 by way of the Americans. I did not write that book immediately after the facts, since at the time I was still almost a teenager, and neither later, during my young adulthood. Many years had to pass for me to work on that event and make it my own, but it did happen. At this point (it was now 1994) the book was ready. I didn't know anyone in publishing houses and I sent it at to a few places (not to too many). I received many rejection letters (but all polite!) and in the end, I received a positive response, by means of a simple phone call that made me terribly happy, from the publishing house e/o that has become the publisher of all of my books (for adults). LL: First comes the idea, which can be born in the most unthinkable ways: a little article in a newspaper, a situation that occurred to someone we know or whom we've heard of, a scene witnessed in the street, a memory that you suddenly recall. From the idea the plot emerges. The plot I need to create in time (and often this is a very long period of time) totally inside of me until the ending. Only when the "path" is very clear in my mind do I begin to write. Evidently, no matter what path one takes, something may change because it is said, and it's true, that the characters that you've created and controlled at times seem to live their own lives and occupy a different space, but not to the point of distorting your plot. PS: Is there an autobiographical element in all of your books? Is there a "favorite" among the books you've written; if so, why? LL: "Madame Bovary c'est moi" Flaubert said, and it's a little bit true, I believe, for all writers, whether or not they're aware of it. It is not, however, said that we always identify with our characters because they possess a part of us. In reality, it is the reader who identifies with the character, when the character is "real", that is when the book is enjoyable. It's clear that for me, when it comes to books that take place during the fascist period, and therefore in that emotional humus in which I grew up and through which I knew the world, there is a strong identification, if not with a single character, with the integratedness of the story. I don't know if the book on my childhood, "Una bambina e basta," is my favorite, though it is definitely the one to which I have the strongest bond. But we writers are also voluble parents, at the right time the last born is always the most well loved. PS: How much time does it take you to write a book? LL: More or less a year for books written for adults, about three months for those for teens, a little less for books directed to the younger ones. PS: You have also written many children's books. Did you first focus on children's stories or adults' stories? Do you focus more on children's stories or adults' stories? LL: Things went this way: I wrote my first book, Una bambina e basta, without thinking about who my audience would be. The fact, however, that the character, the narrator was a little girl, facilitated the circulation of the book in schools, so the primary "audience" really became the "young adult" group. I must say that Una bambina e basta has gotten to its twelfth or thirteenth reprint. After the success of the book, Mondadori 'ragazzi' asked me to write other books for its series "Storie d'Italia", directed to schools. Then, always for adolescent literature, I began to work for Piemme Battello in Vapore, for which I write a few books a year. Paola Sergi grew up in Genova, Italy but has lived in the United States for over twenty years. A voracious reader and devote bibliophile, she works at the Italian Cultural Institute in NYC and is a member of Belletrista's Board of Advisors.